Turmeric is one of my favourite spices - not only it tastes amazing, but also because it's oh so very good for my health! Turmeric is a sort of a natural antibiotic which is great for treating and preventing many diseases. This rice is perfect for when you're feeling tired and a little run-down! Trust me, it works! Fry a medium onion in good quality olive oil. 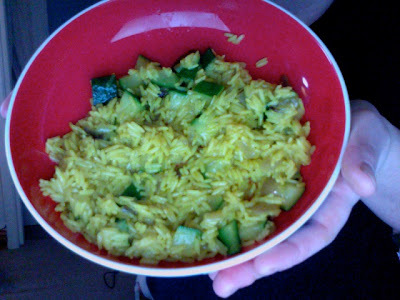 Then add one courgette chopped in cubes. Sprinkle a tea spoon of turmeric and add a cup of rice - white or brown rice, i used white this time. Add a pint of water with one teaspoon os Boulin vegetable stock. Follow cooking times according to package instructions - and Voila!